From medicines and scrubs to fancy creams and DIY home treatments, people have devised numerous ways to lighten their skin tone. With the best skin whitening soaps in India, now it is possible to change your skin tone from head to toe. Yes you heard it right! No cumbersome bleaching or daunting laser treatments are required. You can simply get fair and radiant looking skin by choosing a good skin lightening soap that contains essential natural ingredients that will give you a fairer complexion in just a short span of time. Prepared by professional researchers, these soaps are absolutely safe in achieving a lighter complexion in a fast way. Usage of quality soaps with safe and healthy ingredients ensures that the skin remains supple and smooth while turning fairer. Avoid soaps that contain hydroquinone and sodium lauryl as the two ingredients can have a damaging effect on your skin. Choosing the best skin whitening soap from among the thousands that throng the market today is not an easy task. Therefore, for your convenience, I have assembled a list of top 7 whitening soaps that will perfectly suit your skin type. But before that, let us understand some other important aspects of these whitening soaps. Since there are a number of products available in the market, it sometimes becomes hard to decide the best one for your skin type. 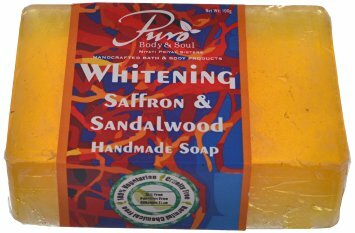 Good skin whitening soaps are made with natural ingredients that do not harm the skin. Kojic Soaps: Kojic is a strong and active ingredient that enhances skin lightening. Kojic Soaps help in getting rid of uneven skin tones, patchiness, dark spots and freckles. However, sometimes kojic soaps can prove to be very harsh for your skin type. They can aggravate the issues of sensitive skin leading to inflammation, redness and itching. 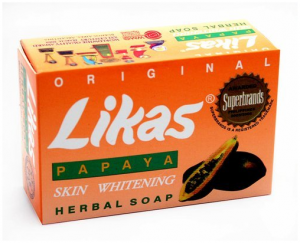 Papaya Soaps: Among all the skin whitening soaps available, these are claimed to be the best. They help in fighting acne spots with visible results in few weeks. Excessive usage of these soaps may lead to dryness of the skin. Make sure to use a hydrating moisturizing cream after using it. Arbutin Soap: The amazing soap helps to lighten the skin along with keeping it fully hydrated. With UV filtering abilities, the soap makes for a great skin care product. Regular usage of the soap bears quick results. 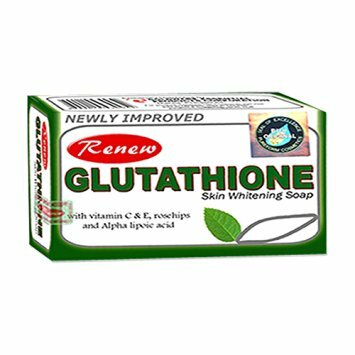 Glutathione Soaps: Glutathione soap help in effectively removing all skin impurities. The rich anti-oxidants in the soap possess supreme anti-ageing properties that help in giving a healthier, younger looking and fairer skin complexion. These soaps are highly suitable for all skin types. Just make sure that the soap you buy contains glutathione in pure state, not mixed with any chemicals. Placenta Soap: Placenta soaps are not very commonly used. However, they help to revitalize and rejuvenate the damaged skin. It fights against the active signs of ageing and dark spots. Ideal for people belonging to a higher age group. How to Choose the Best Skin Whitening Soaps for Your Skin Type? Normal Skin Type: If you have a normal skin type then you can go for Kojic, Arbutin and Glutathoine soaps as your skin won’t react to these. You can conveniently apply the whitening soap for 2- 3 minutes and deeply exfoliate with a sponge. Use a moisturizing lotion after using the soap. Sensitive Skin Type: Papaya soaps are best suited for people with a sensitive skin. If you have a sensitive skin you can also go in for Kojic and Arbutin soaps. Arbutin is gentle on the skin yet powerful when it comes to skin lightening. On the other hand, Kojic soaps are very strong, but they can also be used with extreme care. I would strongly recommend that the application of any skin whitening soap on sensitive skin should not be more than 1 minute. Also, you can avoid using these soaps every day. Twice or thrice a week should be ok. Combination Skin Type: All of you having a combination skin will be glad to know that all types of soaps are ok for your skin type. Just make sure to use them in moderation and don’t leave them for more than a minute. Read the ingredient list carefully to ensure that the whitening soap does not contain any toxic element for bleaching your skin complexion. Papaya ingredients are the best when it comes to skin lightening. A good skin whitening soap has the ability to reduce dark spots, freckles, liver spots, blemishes and hyperpigmentation issues. Always go for a reputed lightening soap which contains skin nourishing and revitalizing properties such as vitamins, moisturizers and emollients. Check out if the soap you purchase has the ability to brighten up dull skin as well. This is a great choice for all of you having a sensitive skin type. The herbal soap works on the skin by reducing pigmentation and repairing sun damage. It is a 100% natural solution that is free from all harsh chemicals. The amazing fairness remedy shows visible signs of skin lightening in just two weeks. If you want a healthy and younger looking skin, then this product is worth giving a try! The highly popular product helps to lighten up the early signs of ageing, scars, freckles and pigmentation making the skin look fairer, lighter and brighter. It contains essential skin ingredients such as rose- hip oil, grape seed extract along with vitamin C that helps to whiten the skin tone. It also protects the skin from the damaging effects of the harsh sun. 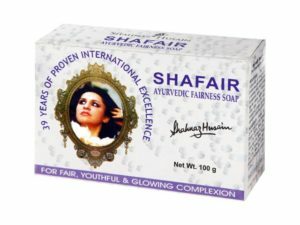 Shafair soaps by Shahnaz Husain contain the essential skin whitening organic ingredients such as turmeric, honey, rose and nimbu patra. The soap contains tiny micro particles that help in skin exfoliation, removing all the dead skin impurities. The healing properties help to fight skin pigmentation and blemishes. With a gentle floral scent, the amazing product keeps you fresh and revitalized, giving you radiant looking and a supple skin. This absolutely amazing skin whitening soap is a great remedy for experiencing supple and younger looking skin. With effective Licorice and turmeric extracts, the soap provides for a fairer complexion in a short period of time Licorice is an effective skin lightening ingredient which is commonly found in almost all the skin whitening creams. It helps to lighten skin pigmentation, scars and blemishes caused due to acne. Turmeric is another effective skin whitening and complexion enhancing element. 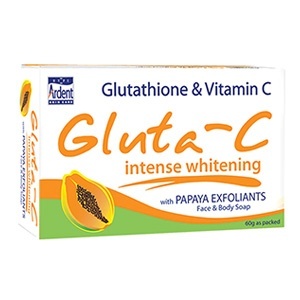 Glupa skin whitening soap contains a high concentration of glutathione that helps to lighten the skin. It also contains essential tea tree extracts that helps to shrink the facial pores, giving anti-bacterial properties. It controls the secretion of excessive oil. The soap contains green papaya and vitamin C that enhances the skin texture and smoothness. It makes the skin 2- 3 shades lighter. 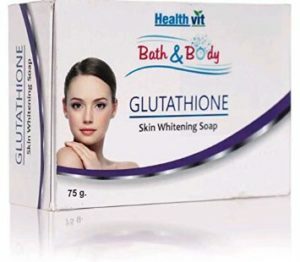 Healthvit bath & body glutathione soap helps in reducing the melanin concentration in the skin. Melanin is the prime cause for dark skin complexion. It also helps to lighten up the scars and blemishes giving you a younger and fairer complexion. Regular usage of the soap will help in generating quick results. This herbal soap is an excellent skin exfoliator that is rich in papaya extracts. It helps to gently exfoliate the epidermis, removing all the dead skin cells and impurities. Papaya helps in achieving a bright and fair complexion with the action of natural enzymes and the alpha hydroxyl acids. The soap is highly suitable for all skin types. 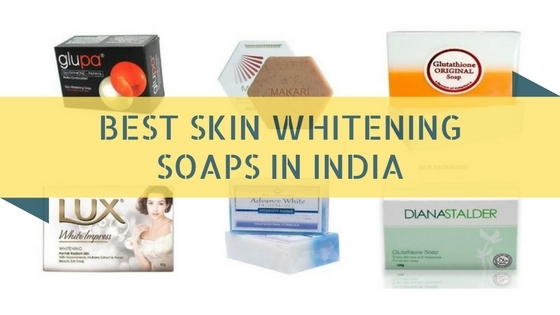 How to Use Skin Whitening Soaps for Best Results? After you have successfully chosen the best skin whitening soap according to your particular skin type, it is important to know how to use it to guarantee good results. 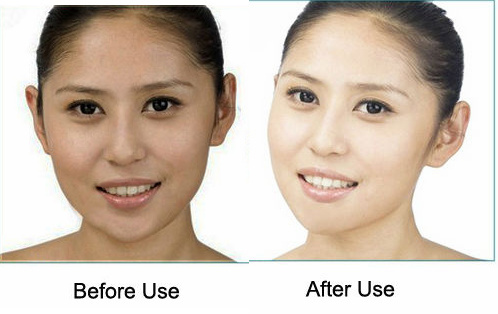 Use a skin whitening soap religiously for 2 months in order to see the change. When applying it, do not overuse or rub excessively in the sensitive areas such as the nose, under eyes, eyes etc. Wet your body with water and gently rub the whitening soap all over it. Exfoliate with a sponge or a loofah for good 3 – 4 minutes. Exfoliation is extremely important to remove all the dead skin cells and other impurities, making the natural ingredients penetrate deep down into your skin. This will help in procuring better results. Always use a good moisturizing cream or lotion as skin whitening soaps have a tendency of making the skin dry. You can also use a skin whitening cream to fetch better results. Gradually, you will begin to see the change in your skin colour. Can Skin Whitening Soaps Prove to be Damaging for Your Skin? A Lot of Brands Out There are Fake: Well, this is true. Even worse, their products might find shelf space in your favourite beauty shop. Watch out for these by carefully checking the ingredient lists and packaging. Make sure they do not contain sodium lauryl, mercury or hydroquinone which are commonly used skin whitening agents, as they may have a vandalizing impact on your skin and body. Too much fragrance is a clue that the soap contains a lot of harmful chemicals. Do Not Overuse: If you think that using the soap more than what is recommended can lead to faster results then you are wrong. Overusing these soaps will not only lead to damaging the dermis level of the skin but also epidermis. Use the soap in moderation to protect your skin from injuring effects of excessive dryness and other skin issues. 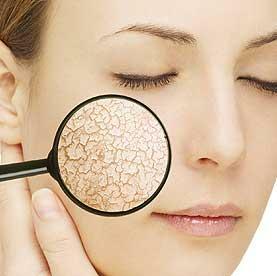 The Skin Becomes More Vulnerable: Skin pigmentation protects the body from the harmful UV rays. Regular usage of skin whitening soaps slows down the melanin production, wakening the body’s natural immunity.